Not long after conducting extensive investigations of tilted martian rock layers along its path, NASA's Spirit rover prepared to resume the trek to the top of the "Columbia Hills" in June. This panorama, nicknamed "Sunset Ridge," shows the terrain that lay ahead of the rover on Spirit's 519th martian day, or sol (June 19, 2005). On the left is the summit of "Husband Hill," Spirit's objective at that time. 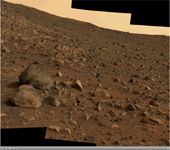 This mosaic of images is an approximate true-color rendering of snapshots taken by the rover's panoramic camera using 750-, 530-, and 430-nanometer filters. Spirit took these images at approximately 3 p.m. local true solar time in Gusev Crater on Mars. The rover then continued to climb throughout July, making numerous scientific investigations of martian rocks along the way.